Aiming to accelerate the therapeutic interaction of the expanding chemical space and biological target space to advance drug discovery, this inaugural eBook, Advances in Combinatorial Chemistry & High Throughput Screening (ACCHTS), opens up a new avenue for rapid access to a focused collection of highly regarded contributions in the field. Importantly, ACCHTS not only highlights major conceptual advances and cutting edge technologies, but also serves as a muchneeded window to the timely, informative, and enabling resources in its parent journal CCHTS. Although biological and biomedical advances coupled with genomics studies have uncovered a large number of potential drug targets, the number of novel target drugs that enter clinics remains dismally low at about four per year during the past thirty years. In order to rapidly translate such impressive gains in biomedical research into much-needed therapeutic agents, we must improve each step in the drug discovery process. For example, developing bioassays that faithfully reflect in vivo biological processes is essential. Expanding chemical space through innovative combinatorial chemistry and natural products-inspired approaches allows for effective interrogation of high-value targets, such as GPCRs and kinases, as well as traditionally un-druggable targets, such as protein-protein interaction interfaces. Progress in laboratory automation and highly sensitive and versatile detection technologies enables unprecedented high throughput screening operations in both industry and academia to accelerate the process of drug lead discovery and characterization. Chapters selected for this inaugural volume reflect promising developments in these critical areas. These contributions describe innovative assay platforms that include both cell-based phenotypic assays and biochemical assays for efficient HTS, and chemical methodologies for building and assessing chemicals. I hope that these chapters will set the standard for future publications to come. While technology development is important for accelerating the process of drug discovery, rapid development of the chemical biology field and the emergence of a large number of chemical probes are expected to fuel innovations that will be essential for finding novel target drugs. By integrating new developments in chemical biology and probe discovery into drug discovery, ACCHTS would be in a unique position to catalyze the discovery and development of the next generation of efficacious and safe therapeutic agents. There are about 7000 diseases that afflict mankind, treatments are available only for ~200 diseases. With the genetic basis for most of these diseases known, there is a large repertoire of un-drugged therapeutic targets to explore. The process of drug discovery has benefited in the past decade by the advent and rise of highthroughput screening (HTS), an early and vital step of screening small molecule libraries primarily through biochemical and cell-based assays. Central to every HTS endeavor is the compound collection. Industry-style probe discovery has now gained unparalleled momentum with the availability of vendor-supplied chemical libraries and ready access to institutional HTS laboratories. The US NIH Roadmap program and the newly organized EU-Open Screen have greatly influenced the global drug discovery landscape. Likewise, India and China have stepped up their drug discovery research infrastructure. The recently formed International Chemical Biology Society, an independent, nonprofit organization, is dedicating itself to promote research and educational opportunities at the interface of chemistry and biology, by providing an important international forum that brings together cross-disciplinary scientists from academia, nonprofit organizations, government, and industry to communicate new research and help translate the power of chemical biology to advance human health. 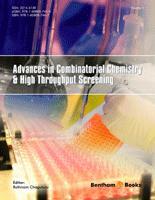 Combinatorial Chemistry & High Throughput Screening (CCHTS) was the only journal that served the needs of the two disciplines, high throughput screening and combinatorial chemistry, when the very first issue appeared in 1998. The Aims and Scope of CCHTS have never been more relevant than now. A look at the manuscripts published in Combinatorial Chemistry & High Throughput Screening is reflective of this commitment and readership’s interest. We are making every effort for the journal’s success, improving its high standard by publishing quality science articles and guest-edited thematic issues. This eBook, Advances in Combinatorial Chemistry & High Throughput Screening (ACCHTS), is another effort to showcase CCHTS authors and a significant milestone in the annals of CCHTS. The wide range of topics represented by these chapters is faithful to the scope and purpose of CCHTS, and a testament to CCHTS contributions in advancing drug discovery on full throttle. In the words of my good friend, Professor Haian Fu, this eBook “opens up a new avenue for rapid access to a focused collection of highly regarded contributions in the field.” My gratitude to all those who have helped in developing ACCHTS, the authors, reviewers, section editors and publishing staff, for their time, advice, expertise, and tireless effort.